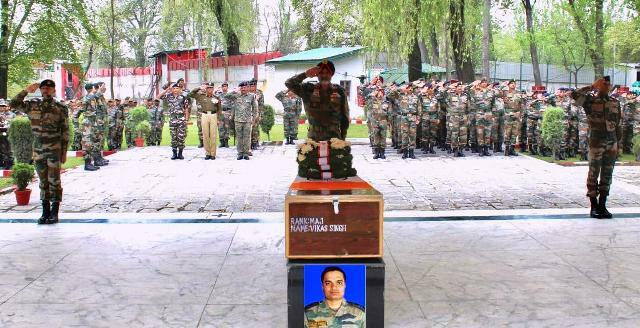 Srinagar ,April 15 (Scoop News)-Army today paid a befitting tribute to Maj Vikas Singh who made the supreme sacrifice on 14 April 2019 in the line of duty. The officer was leading a patrol in the mountainous terrain along line of control in Northern Kashmir. While attempting to save the soldier in front of him who had slipped, the officer lost his footing and fell down the mountain. Owing to the severity of the fall, he sustained grievous injuries to his head and chest. He was evacuated to 92 Base Hospital for medical treatment, but succumbed to the injuries sustained during the fall. Lt Gen KJS Dhillon, Chinar Corps Commander and all ranks paid homage to the martyr on behalf of a proud nation. In a show of solidarity, representatives from other security agencies also paid their last respects to the martyr.